Donald J. Cain - Kain-Murphy Funeral Services-Serving Haddonfield, Cherry Hill, Haddon Heights, Haddon Township and surroundings. Don “Sauce” Cain, 62, resident of Haddonfield, New Jersey, passed away Sunday, July 22, 2018. He is survived by his beloved wife, Valerie, and his two loving daughters, Shelby and Shannon. He is also survived by his mother, Mary; brothers, Gerald and John, and sister Dianne, as well as many nieces and nephews. Don was predeceased by his father, Francis. He was a devoted husband and father, and a friend to many. Don was known for his vibrant personality, his love for life, and his passion for Ultimate Frisbee. He started playing Ultimate Frisbee at East Brunswick High School, then went on to Rutgers University and helped secure multiple National championships in Ultimate (1974-76). After Rutgers, Don played on various New Jersey club teams that contended at the National level. 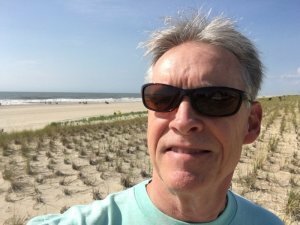 Don played many decades of summer league Ultimate Frisbee in Mercer County, NJ, and then with the Philadelphia Area Disc Alliance (PADA). Don was elected into the PADA Hall of Fame in 2016. He was still “winning the fields” with his ever present smile, story, or cold beverage. His most notable Frisbee Disc achievement was the Maximum Time Aloft World Record of over 16 seconds which was set at a Philadelphia tournament in 1984. That record still stands today. Don also filmed two Pepsi Generation commercials using his Disc talents. The main ad was filmed in New York City in 1978 and the other was filmed in Venezuela in 1981. Don’s early career was at Herman Miller, followed by many years in sales of radiofrequency cable connectors at M&S Electronics and RF Depot where he enjoyed interacting with customers from all over the world. Most recently, Don took joy in working and making new friends at Amazon. Don spent many summers on LBI where he loved the ocean waves and fishing. Don lived life to the fullest, and will surely be missed. Relatives and friends are invited to a visitation on Friday, August 24th, from 6:00-8:00 pm at Kain-Murphy Funeral Home, 15 West End Ave., Haddonfield. Memorial services will be held on Saturday, August 25th, at 11:00 am at the Lutheran Church of Our Savior, 204 Wayne Ave., Haddonfield. In lieu of flowers, donations may be made to Ultimatepeace.org, (Ultimate Peace Inc.,78 Crittenden Hill Road, Shelburne Falls, MA 01370) whose mission is to build bridges of friendship, trust, and leadership between youth who live in communities divided by conflict, using the values-based sport of Ultimate as its tool.